Back cover blurb: The dark and glittering new novel from the Sunday Times Bestselling author Kate Hamer is as gripping as it is gorgeously written - the perfect second book from the author of The Girl in the Red Coat. My name is Ruby. I live with Barbara and Mick. They’re not my real parents, but they tell me what to do, and what to say. I’m supposed to say that the bruises on my arms and the black eye came from falling down the stairs. But there are things I won’t say. I won’t tell them I’m going to hunt for my real parents. I don’t say a word about Shadow, who sits on the stairs, or the Wasp Lady I saw on the way to bed. I did tell Mick that I saw the woman in the buttercup dress, hanging upside down from her seat belt deep in the forest at the back of our house. I told him I saw death crawl out of her. He said he’d give me a medal for lying. I wasn’t lying. I’m a hunter for lost souls and I’m going to be with my real family. And I’m not going to let Mick stop me. 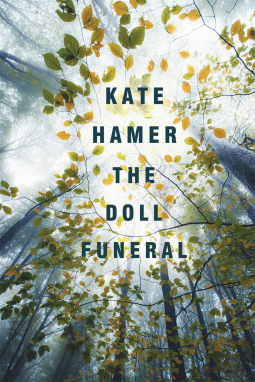 The Doll Funeral is a novel that I had been anticipating for quite some time. After Kate Hamer's impressive debut The Girl in the Red Coat I was intrigued to read what this author had to offer next. I have to confess I was expecting a novel in the same vein and was a little disappointed to find it wasn't. However, it is a very good book. Perhaps just not my cup of tea this time around..
Ruby lives with Barbara and Mick, they are not her real parents, and she is in fact relieved to find out that she is adopted on her thirteenth birthday (as an adopted child, this really stuck out to me - thirteen seems awfully late to tell someone that they were adopted - I digress), as her adoptive Father is abusive to her. Her adoptive Mother, pretty useless. Ruby finds solace from her home life amongst the trees and beautiful landscapes of the Forest of Dean where she lives. Here she seeks to find her true family, her birth Mother and Father, and get away from the harsh reality of her every day life. Ruby's journey is a long one. The Doll Funeral could be a coming of age story of sorts, but it's paranormal undertones and complexities sometimes make it hard story to follow. Particularly as we are drip fed Ruby's back story in alternating chapters with the present day. Beautifully written, The Doll Funeral will most certainly be a perfect book for some readers. But sadly it wasn't perfect for me. The Doll Funeral is available now via Amazon online and all good book shops.